At pick number 16 in the 2019 NFL Draft, the Carolina Panthers could decide to go in many directions, but it would appear that after signing free agent center Matt Paradis and Bruce Irvin earlier this offseason, they’re leaning towards either edge rusher or surrounding Cam Newton with more protection on the offensive line. There are as many as five offensive tackles that are projected to be selected in the first round and the Panthers will have an opportunity to potentially select Alabama’s Jonah Williams, Florida’s Jawaan Taylor or Washington State’s Andre Dillard – all quality players that different draft analysts have as their #1 tackle in the draft class, sure to be impactful players in the NFL. But there should be a cautionary tale for what many may consider a sure thing. Since the 1999 NFL Draft, there have been 38 tackles – both left and right – selected from picks 1-16. Of those picks, 16 players have been named to a Pro Bowl team and one, Jack Conklin, who the Tennessee Titans selected in 2016, was named a first team All-Pro as a rookie. If you add Conklin to the 16 players that have been named to Pro Bowls, that makes for a success rate of 44.7% – considering how big of a crapshoot the draft actually is, that shouldn’t be a huge surprise; but a less than 50% success rate in the first half of the first round is less than ideal. Chris Samuels (2000), Jordan Gross (2003), Jammal Brown (2005), D’Brickashaw Ferguson (2006), Joe Thomas (2007), Jake Long, Branden Albert, Ryan Clady (2008), Trent Williams, Russell Okung (2010), Tyron Smith (2011), Lane Johnson (2013), Taylor Lewan (2014), and Brandon Scherff (2015) have all been named to multiple Pro Bowls; Long’s career, while good at first, ended because of major knee surgeries after the 2016 season – he had only played 10 games the previous three seasons combined. On the flip side, it’s fair to call picks such as Kenyatta Walker (2001), Mike Williams (2002), Robert Gallery (2004), Levi Brown (2007) and Ereck Flowers (2015) draft busts, even though many considered them to be among the best players of their respective drafts. Out of the previously mentioned names, Flowers is the only one still playing in the NFL, on his third team since 2015 as he signed a one-year contract with the Redskins during the offseason. The Raiders chose Gallery in 2004 when they had an opportunity to pick Larry Fitzgerald, Philip Rivers, Sean Taylor, DeAngelo Hall or Ben Roethlisberger instead; while Gallery started 91 games for the Raiders, the second overall pick failed to make a Pro Bowl appearance in his eight-year career. Carolina themselves have selected one tackle in the first round from picks 1-16 during the last 20 years, and he turned out to be one of the best players in franchise history. 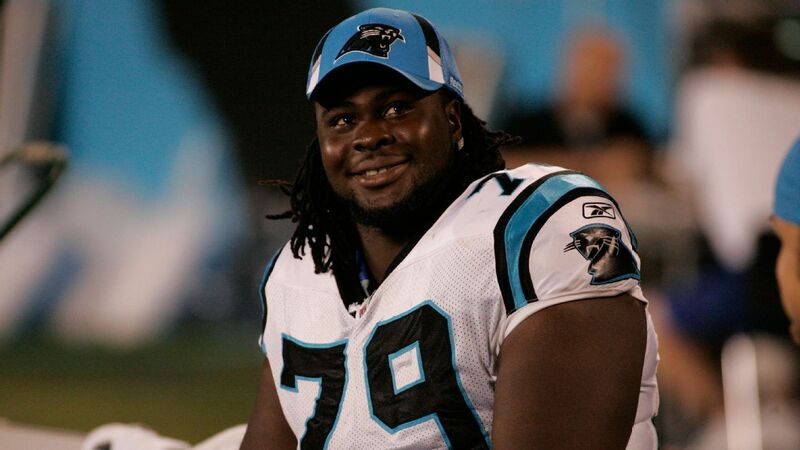 Panthers fans will remember that in 2003, the team selected Utah tackle Jordan Gross at No. 8 overall; Gross played 11 seasons with the Panthers and was named to three Pro Bowl teams (2008, 2010, 2013) before retiring after the 2013 season. Also, although the pick wasn’t within the 1-16 range, in 2008, the Panthers went the tackle route again as they traded up to pick Jeff Otah out of Pittsburgh with the 19th overall pick. But injuries and ineffectiveness would have Otah out of the league after the 2011 season. The moral of the story is just because teams choose a tackle that’s ranked high on draft boards doesn’t mean it will work – especially when everyone’s draft board is different. The biggest reason a lot of offensive tackles don’t translate well to the NFL is because a lot of college schemes are very simplistic. Most linemen don’t have to do much adjusting or reading defenses and the speed of edge rushers in the NFL is something that traditional tackles don’t see on an every week basis like most would in the NFL. This draft is critical to not only the Panthers but the future success of Newton, especially with the franchise quarterback coming off another shoulder injury. 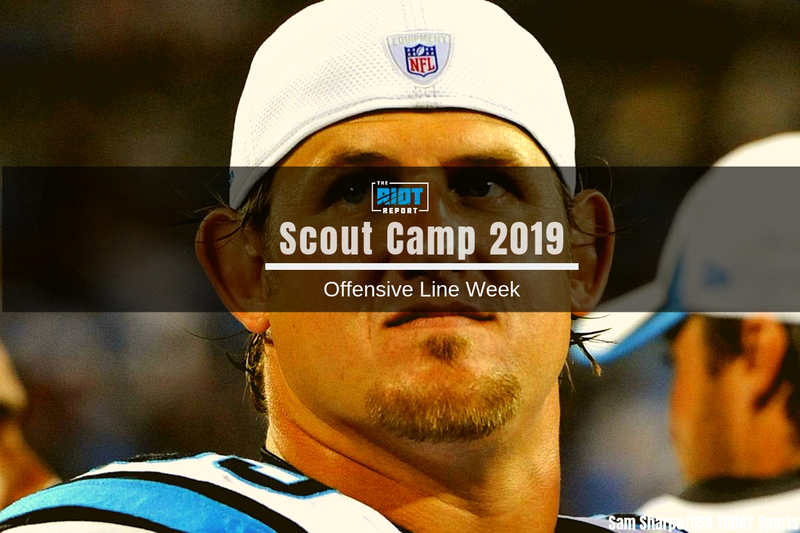 That’s why they have to continue to build their offensive line with the hopes they can find a consistent starter at both tackle positions – whether that’s the newly signed Daryl Williams, Taylor Moton or the Panthers’ 2019 draft pick remains to be seen. Out of the top tackles this year, it is an almost certainty that one of them will bust. All of them could potentially bust, but the odds are at least one of them will be a solid starter in the league for years to come – and at least one will likely be playing in a different uniform, or even out of the league, come 2023. Carolina had better hope they can find their 2019 version of Jordan Gross instead of Jeff Otah. I get that you want to use Otah as an example (because it’s really convenient), but really the ONLY reason that he didn’t work out is due to injury. He looked promising otherwise. He certainly wasn’t Ereck Flowers when healthy. Availability is an ability, Phillip. Staying healthy is part of the game and yes Otah was a bust even if he couldn’t get on the field. I agree with both of you. I think the issue with what you said was this specific line “But injuries and ineffectiveness would have Otah out of the league after the 2011 season.” I agree with the “injuries” part. But when he was on the field he was far from ineffective. It sounds like that’s also what Phillip is trying to say. You’re absolutely correct. Otah was effective before he got hurt. He looked like an answer for years to come.